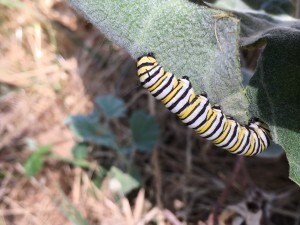 A monarch caterpillar eats showy milkweed at Davis Ranch in Colusa, California. The western population of monarch butterflies is in steep decline, according to a recent study released by the Xerces Society, having fallen 74 percent in the past two decades, from roughly 1.2 million in 1997 to fewer than 300,000 butterflies in 2015. Studies have documented the drop in eastern populations over the past several years, but this is the first time we’ve been able to understand the risks to the western population, which resides west of the Rocky Mountains. The population is struggling because of development around the forested groves where they spend winters along the California coast and in Mexico, and because of pesticide applications that kill vital milkweed habitat. These threats and the population decline are significant, having the potential to influence a U.S. Fish and Wildlife Service decision in coming years if the situation fails to turn around soon.